Bill Potter bought the company and Carl’s designs in the late sixties and began to commercially produce them. He was a stickler for high quality and built the boats to bulletproof specifications with specialized fiberglass and techniques. During his tenure at the SeaCraft Boat Company every hull that the company manufactured was made to exacting standards. Because of this, “Potter Built” hulls from the 1970s are in great demand. Although the finishes deteriorate over time and the fittings on the boats loosen up, the hulls themselves maintain the same strength and integrity today that they were built with 40 years ago. I have owned a 1972 SeaCraft for the last 25 years, and it has always gotten me home…no matter how badly the weather deteriorated! In the spring of 2008 I began looking for a replacement for my vintage SeaCraft. None of the new production hulls that I test drove gave me the feeling of security and seaworthiness that my SeaCraft provided. The new boats had awkward interior configurations with bulky compartments molded into rails and transoms, limiting deck space for anglers and providing ineffective storage. It became apparent that to have the boat I really wanted; a custom design would be required. 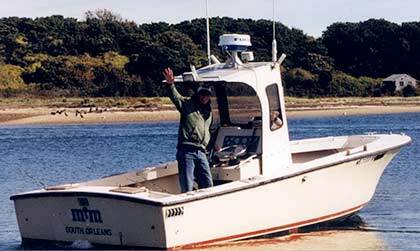 Conversations with Acadia Boatworks in July 2008 convinced me that a complete rebuild of my trusted 1972 SeaCraft would provide me with the fishing machine I was looking for. The rebuild converted the boat from inboard/outboard to outboard power. A custom outboard bracket from Hermco in Florida extended the overall boat length to 26 feet. A Suzuki DF 300 provided quiet, dependable power and lightning speed. 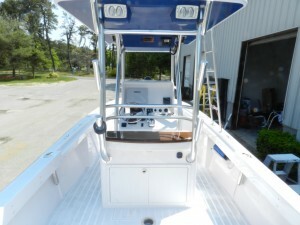 Plans were drawn for a custom deck, center console, leaning post with tackle storage station and hardtop. Every part was designed to optimize available space, utilize the latest marine components and maximize fishing performance. Design sessions with Eric Kent at Kentfab aluminum fabrication provided plans for the hardtop framing and the addition of a buggy top and second station controls to optimize fish spotting capabilities. After discussions with Simrad Marine electronics, we decided on an integrated electronics system built around the NSE12. New CHIRP sonar capability, Broadband radar and marine weather would complement the navigational capabilities of the GPS system, and all would be displayed on a 12 inch multi-function screen. 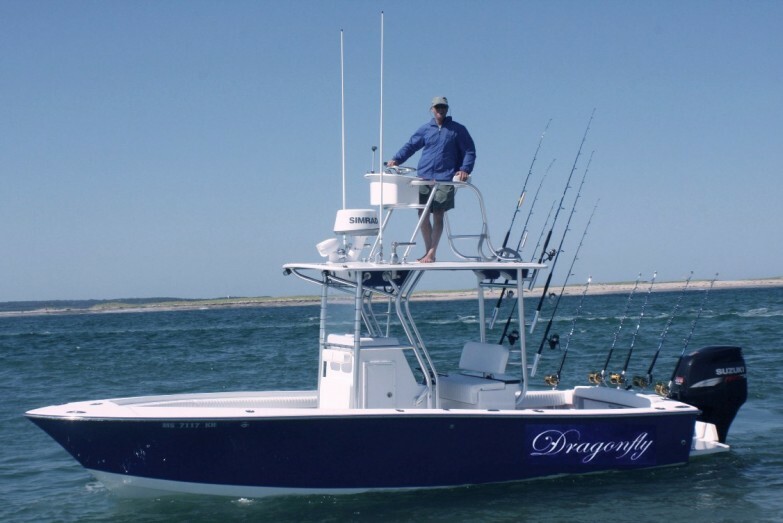 The Dragonfly boasts state of the art fish-spotting technology, as well as a custom hardtop for spotting fish the old-fashioned way! Work commenced in August 2008. The hull was entirely stripped of the old wood coring materials and the rebuild began. State-of-the-art epoxies and resins, light weight synthetic core materials and vacuum lamination technologies were employed throughout the process. Meticulous handcrafting proved time consuming but the end result, ready for service in the spring of 2012, is the ultimate fishing machine for Cape Cod waters. 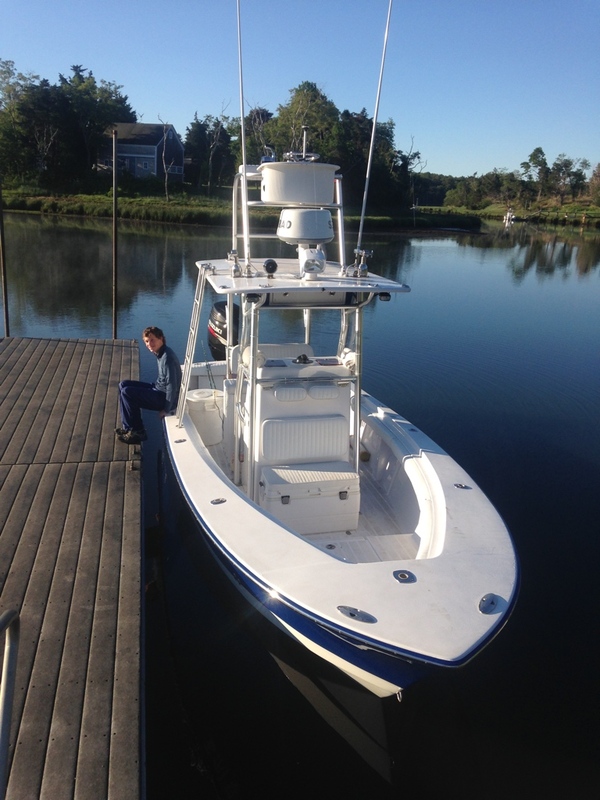 The boat is named Dragonfly after a favorite fishing spot in the rips off Monomoy Island. 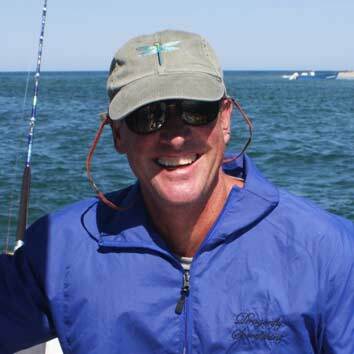 While fishing there on a windy day in the 1980s a very large (and tired) dragonfly landed on my hat…blown offshore from the fresh water pond on the southern tip of Monomoy, several miles away. He stayed there for an hour and a half while we caught more than 40 huge striped bass. At that point the wind laid, the fully rested dragonfly took off back towards Monomoy and the fish stopped biting. I have called the spot Dragonfly Rip ever since! It seemed appropriate to name my beautiful new boat after a good luck fishing spot. I look forward to having you aboard with me this season on the new and improved Dragonfly.